I’ve always loved Halloween. In fact, I encourage dressing up all the time with my kids. Capes. Sombreros. Pirate patches. Tutus. My daughters’ closets are filled with an assortment of costume pieces and parts. One minute they are fairies, the next knights. But when my older daughter was three, she tested my parenting allegiance to imaginative play when she declared herself a boy. My daughter’s obsession with boy-hood began with an intense adoration for Nickelodeon’s Diego. Like many preschoolers, she found this animal rescuer worthy of high praise, especially since he lived in South America like my husband had during his days as a Peace Corps volunteer. I never minded my daughter being a daddy’s girl. I knew we’d had our share of fun, too. But when I was pregnant with my second child and she started introducing herself as the “big brother,” I began to worry. As an educator, I knew the value of role-playing and how it helped children negotiate gender roles, among other things. But I was struggling to embrace my daughter’s attitude of Why can’t every day be Halloween? This may be one reason dressing up has such a long tradition. 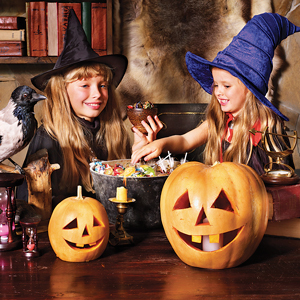 All Hallows Eve dates back to the 1500s in Scotland. While adults largely participated in this Celtic practice, children going guising around neighborhoods became fashionable in North America by the early 1900s. This paved the way for costume parties and parades. And we all know the rest of the story. It wasn’t long before Halloween turned into a billion dollar industry. Stores now line their aisles with tricks and treats months in advance. According to OneStep Retail Solutions, since 2005, consumer spending on Halloween has increased by more than fifty-five percent. 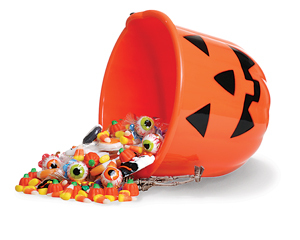 In a survey conducted last year, consumers said they spend an average of $75 per household, for a grand total of about $6.9 billion dished out as a nation – on the purchases of costumes for kids and adults, decorations, party favors, and of course, candy. As a parent who wants her kids to make healthy food choices all year long, I struggle a little bit with the sugar and artificial dye overload that is Halloween. Admittedly, I’d like to shift the balance of fun to the dress-up side of the holiday. Besides, if we’re putting all of this money (and time) into Halloween – costuming our kids, ourselves, and our pets, why not help our children really get something out of it? Beyond having the satisfaction of raising creative kids, Molly and her husband have reaped the benefits of encouraging dress-up at home. “Over the years we have watched – and the little entrepreneurs even charged admission to some – performances featuring superheroes, dance, gymnastics, animals, and sports stunts to name a few,” says Molly. Furthermore, according to Jennifer, research shows that kids who play pretend are less aggressive, stay focused, and control their impulses. So if your kids have outgrown their dress-up box, consider encouraging creative pursuits around Halloween itself. Jennifer suggests that kids use their electronic devices to make trailers and commercials that work with their costumes. For example, her 10-year-old son will go into the backyard to “make a movie.” Acting is a great way to maintain dress-up’s social acceptability while still allowing kids to practice negotiating emotional situations longer. If you start early enough, you really can get your kids more into the creative aspect as opposed to the candy side of Halloween. In fact, the more you stretch out the imaginative elements of the holiday, the greater your chances of keeping your kids in touch with their playfulness all year long. From that moment on, my daughter was back. Apparently, my stint as an amateur firefighter showed her mommies also have adventures. Granted, she asked Santa for a Peter Pan costume that year, but her desire to role-play across genders no longer phased me. In fact, I celebrated my daughter for learning early on what it took me years to realize: There’s incredible power in enjoying the best of both worlds. Boy or girl, that is exactly the kind of kid I want to raise, and may be the biggest treat about Halloween: At least one day every year, you can be anything you want to be. Although many families with children who have uber-strict diets or food allergies have to do it, good luck trying to get your kids to completely forgo the candy mountain this Halloween. We recommend these strategies to at least help families get as enthusiastic about dressing up as they do about pigging out. 2. Inspire your kids to not only choose their own Halloween identity, but also to create it. Goodwill and other second-hand stores are a great place to start. So no one sews in the family? No biggie. Start with boxes, ductwork tubing, and other recycled materials to get the creative juices flowing. Think robot, gift-wrapped box, stop light, or a cell phone. 3. Help your kids plan a book-trade party this month to encourage dressing up. Friends can come as a favorite literary character and bring a new or used book from home to trade with a party guest. 4. Try to encourage your kids to participate in spirit days (book character themes, career days, crazy hair days) at school and on their sports teams. There are also dress-up and theme days at local parks and during some camps. 5. 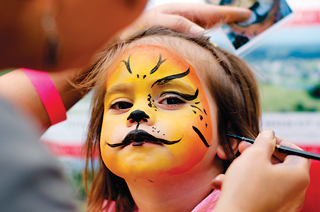 Attending costume-friendly events during October lets kids show off their creativity. Next articleWelcome to the fall of 2014, readers!